Good afternoon, everyone. I just wanted to share a few important updates of which you should be aware. The Steering Committee is in the process of setting up a meeting with the Chicago Community Trust to discuss the Benefit Chicago initiative, sponsored by the MacArthur Foundation, the Chicago Community Trust and the Calvert Foundation. This initiative will fund social enterprises. We will also discuss the range of products and services provided by the Chicago Community Trust, and the needs of our membership, as outlined on the North Lawndale Community Snapshot survey. We will keep you posted of the outcomes of the discussion. 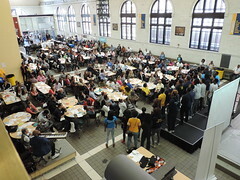 A number of our members participated in the Chicago Community Trust’s On the Table conversations on May 10th. The Trust will be providing fifty $1,000 grants to various participating groups to ensure that some of the ideas that were discussed to bring about community unity are implemented by the end of the year. Here is the video from the NLCCC application. If selected, we will use proceeds towards the first annual North Lawndale Arts Festival in Douglas Park, to be held August 6, 2016, from 10 am-7 pm. We should know the outcome of the competition the first part of July, 2016. NLCCC will be applying for LISC Quality of Life planning funds to strengthen our comprehensive planning process, currently under way with the Chicago Metropolitan Agency for Planning (CMAP). CMAP is currently facilitating the comprehensive planning process, with a focus on land use around housing, transportation, infrastructure, economic development, health care and arts and culture. If we are successful in securing this, we will use the funding to help us strengthen initiatives in those areas that are not being emphasized in the CMAP planning process, such as technology, education, public safety, workforce development and capacity building. We will submit our letter of intent by June 17, 2016, at 6:00 pm. New Covenant CDC, the fiscal agent for the NLCCC comprehensive planning process, will also serve as the lead agency in this application. 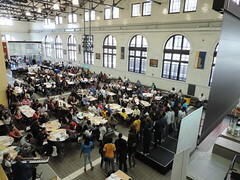 Lawndale Christian Development Corporation was the lead agency for the North Lawndale Quality of Life Plan completed in 2005. We thank Richard Townsell, Executive Director of LCDC, and the chairman of the NLCCC housing subcommittee, for supporting this effort. Please let us know if you are interested in participating in this planning process. If so, we ask that you provide us your contact information so that we may include it as an attachment to our letter of intent to LISC. Ideally, we would also like you to include a letter of support as well. We will provide a model letter under separate cover to those agencies that have expressed an interest in participating. Please find attached a PDF file of our meetings flyer outlining the meeting schedule for NLCCC subcommittees, as well as a copy of our brochure. A link to the electronic application is found here. Please join the Board of Directors of Habilitative Systems, Inc. (HSI) on Monday, June 13th at 6:00 pm at the South Shore Cultural Center for an evening overlooking Lake Michigan, enjoying appetizers and cocktails while learning more about this dynamic organization. For more information, please click here. Please share these announcements widely. Your assistance, as always, is most appreciated!